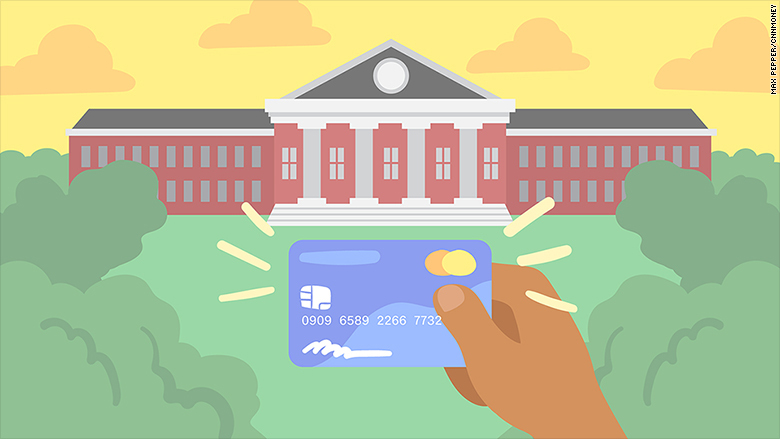 Should I open up a credit card in college? Opening up a credit card while you're young can generally be helpful to your all-important credit score. That's because the earlier you open up an account, the longer your credit history. But with great spending power comes great responsibility. If you overspend and aren't able to pay off your balance in full every month, you risk falling into a debt trap that can haunt you well into adulthood. "Carrying a balance on a credit card, the interest will just eat you alive," said Certified Financial Planner Michelle Brownstein, who is also a senior vice president at online financial advising firm Personal Capital. Related: Should I save for retirement or pay off student debt first? Responsible use of a credit card is a major factor in your credit score -- which is the three-digit number that lenders use to assess your creditworthiness for a loan. Your credit score is based on various factors, including your bill payment history, how much of your available credit you use, types of credit and your credit history (ie: how long you've had lines of credit). And it's not just lenders who are checking out credit scores and history. Landlords, employers and even cell phone companies are also known to run credit checks. But Millennials seem to be a bit hesitant to jump on the credit card bandwagon. A recent survey from Bankrate shows that one-third of people between the ages of 18 and 29 have a credit card. Brownstein opened a credit card at 18, and said that decision enabled her to buy a condo in San Francisco at 26. "My credit limit was nothing ... but I got into the habit of paying it off," she said. "I don't think I would have been able to get a mortgage if I hadn't done that." Related: Is it ever too early to start saving for college? But taking on credit at a young age can be risky. It's easy to overspend when you're swiping plastic, especially when you're young and not used to managing your own money. And first-time credit cards tend to come with higher interest rates, which means carrying a balance can lead to a debt pileup that takes years to pay off. Some experts recommend waiting until after college when there's a steady paycheck to open a credit card. "A credit card should be associated with a job," said Carla Dearing, CEO of SUM180, an online financial planning service geared toward women. "If you are taking on debt, you need a way to repay that debt." The government passed legislation in 2009 to protect college students from taking on too much credit card debt. The CARD Act requires those under 21 to show proof of income or have a co-signer before opening a credit card. Related: Should I buy a home while still paying student loans? To help avoid credit card overspending, experts advised keeping a budget that tracks your income and your spending, and then being selective with what costs go on the credit card. "Think of a credit card like a debit card. Never spend more than you have in your bank account," said Brownstein. And because credit utilization is a factor in your score, experts recommended keeping your spending well below the card's limit each month. Becoming an authorized user on an already-established credit card can also help build credit. Authorized users can spend freely on the card, but aren't liable for payments, which means cardholders should be selective with who they allow to jump on their cards.